MCC provides educational and clinical training for individuals who are interested in becoming a practitioner specializing in cannabid therapeutics. The California Department of Social Services (CDSS) has approved this Class under the CDSS Continuing Education Program for Licensees of Health Care Facilities. This online 2-hour class provides 2 units of credit toward the California Department of Social Services Continuing Education Requirement of Licensees Re-certification. The MCC is a nonprofit organization founded in 2006 for the purpose of providing education and resources that support the advancement of health care services provided to patients who have a physician’s approval for the use of cannabis. The MCC is located at 52 North Mentor Avenue in Pasadena, California. Over 3,000 participants including physicians, patients, attorneys, dispensary operators, cultivators, law enforcement officers and municipal officials have attended classes and workshops provided by the MCC. 2018 the CDSS approved the MCC to teach a Course on Senate Bill 94 for Licensees of Health Care Facilities. The Course is currently taught under the CDSS Continuing Education Program for the Re-certification of Health Care Facility Licensees and Administrators. 2012 the CDSS approved the MCC to teach a Course on Senate Bill 420: California’s Medical Marijuana Program. The Course was taught under CDSS Continuing Education Program for the Re-Certification of Health Care Facility Licensees and Administrators. The MCC is represented on the Advisory Board for the National Institute of Health, 5-year, longitudinal study on the Use of Cannabis Among Young Adults in Los Angeles County. The MCC Physician Orientation is an on-line class for physicians who approve a patient’s use of cannabis. The Orientation focuses on compliance under federal law and Medical Board guidelines, including liability issues related to the approval of a patient’s use of cannabis. In a clinical setting, Program Participants learn how to provide patient information regarding the medicinal use of cannabis, including product formulations, CBD products, dosage, risks/side effects, drug interactions, overdose, ingestion methods including capsules, sublingual sprays, salves, pain patches, vapor pens and suppositories. The MCC issues a Certification that the Participant has successfully completed forty (40) hours of clinical training related to providing medicinal cannabis services and products under California’s Senate Bill 94 Regulations. The Landmark Research Collective, established in 2016, serves as a clinical teaching collective for the MCC Medical Cannabis Practitioner training Program. The MCC Practitioners use a HIPAA Compliant ON-LINE Tele-Health Platform to assist patients, who are non-ambulatory, in obtaining the required physician’s approval for the use of cannabis. Using the Tele-Health Platform, Practitioners are able to provide the patient information that is needed in order to use cannabis effectively and safely a complementary treatment option. Although many cities have an Ordinance prohibiting the distribution of cannabis, the City cannot deny the licensing of a Medical Cannabis “Information and Resource” Center. 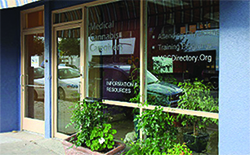 The Information and Resource Center includes a cannabis bookstore, cultivation classes, a physician’s office for medical cannabis approvals, and patient information services regarding the medicinal use of cannabis/CBD and the Department of Public Health ID Card Program for Patients and Primary Caregivers under the MMP. The Center can be used to effectively generate community support for the licensing of a Medical Cannabis dispensary. In association with DJ Short, the MCC initiated the “Blueberry Project” for the purpose of identifying the genome, of an optimum phenotype of the cannabis strain known as Blueberry, and standardizing the key genetic markers in a pharmaceutical grade product. Under Senate Bill 94 related to the medicinal and adult use of cannabis, California residents are permitted to cultivate up to six (6) plants. However, there is no insurance for fire or damages resulting from the cultivation of cannabis within a residence. The MCC established the Cultivation Workshop to serve as a model for a secure and insured location for qualified patients to cultivate six (6) plants. The Workshop is managed by a cultivation instructor. Workshop participants pay a monthly fee. The Landmark Research Collective (Dispensary) and the MCC 6-Plant In-door Cultivation System is Clean Green Certified. The Clean Green Program, founded by Chris Van Hook a USDA Organic Certifier, is based on the USDA Organic Program. The MCC continues to actively promote the Clean Green Program for dispensary facilities and cannabis cultivators.